There are a variety of ways different ways to create superscripts and subscripts in Word, Excel and PowerPoint. All of which are covered in detail for each program below, so you can choose which one you like best. A superscript is text formatting set above the normal baseline (as pictured above on the left) and is most frequently used in mathematical equations and chemical formulas. A subscript is text formatting set below the normal text baseline (as pictured above on the right) and is also often used in mathematical equations and chemical formulas. The Subscript shortcut is Ctrl + = on a PC and Ctrl + Cmd + + on a Mac. This shortcut works in Microsoft Word and PowerPoint to quickly create (or remove) a subscripts without using the insert equation feature (another way to create subscripts and complex mathematical equations). To subscript in Excel with shortcuts, you need to use a combination of keyboard shortcuts on a PC. The superscript shortcut is Ctrl + Shift + = on a PC and Ctrl + Cmd + - on a Mac. This shortcut works in Word and PowerPoint to quickly create (or remove) superscripts on the fly without using the insert equation commands (another way to create superscripts in your documents). To remove the superscript after you have applied it, simply select it (in this case the 2) and hit the Ctrl + Shift + = shortcut a second time to remove it. 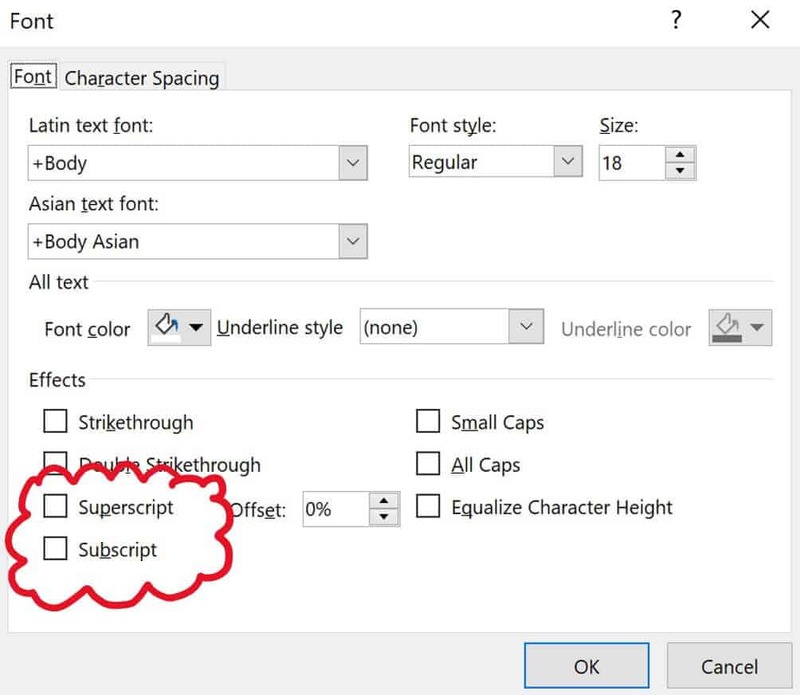 Besides the two keyboard shortcuts mentioned above, there are 2 additional ways to quickly create superscripts and subscripts in Word. While this is a super fast way to create these text effects, if you navigate through the Font Dialog box, you get a bunch of other additional options (discussed below). One reason why the Font Dialog box is better than the standard keyboard shortcuts above, is that it gives you additional text effect and formatting options. Instead of using the keyboard shortcut to open the Font Dialog box, you can always open it by clicking the diagonal facing arrow in the Font Group on your Ribbon as pictured above.. Besides the two keyboard shortcuts mentioned above, you can use your Font Dialog to create subscripts and superscripts in PowerPoint. 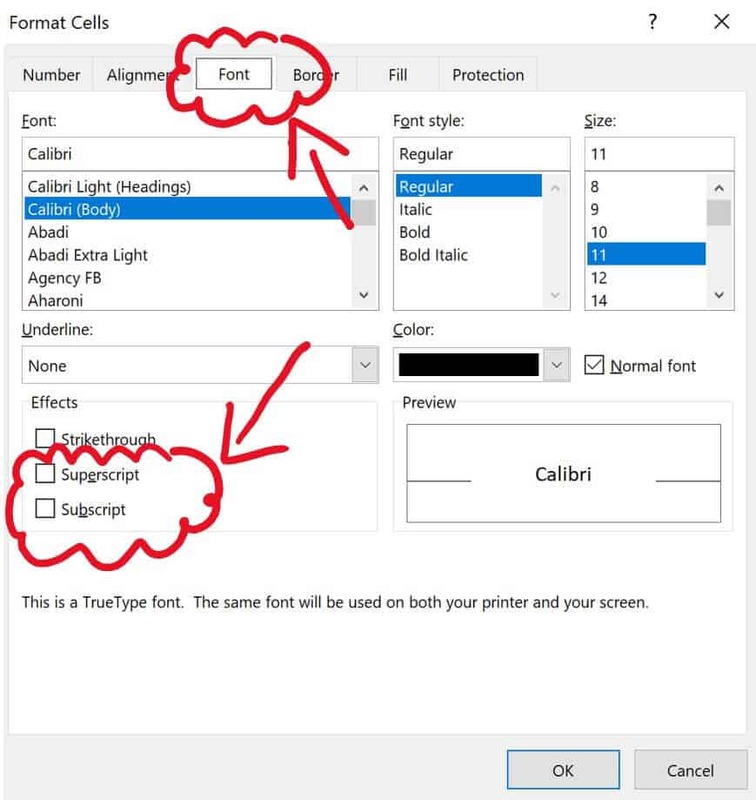 Instead of using the Ctrl + T keyboard shortcut to open the Font Dialog box, you can always open it by clicking the diagonal facing arrow in the Font Group in your PowerPoint Ribbon. To see see the PowerPoint subscript and superscript shortcuts in action (including the Font Dialog box shortcut) see the short how to video below. 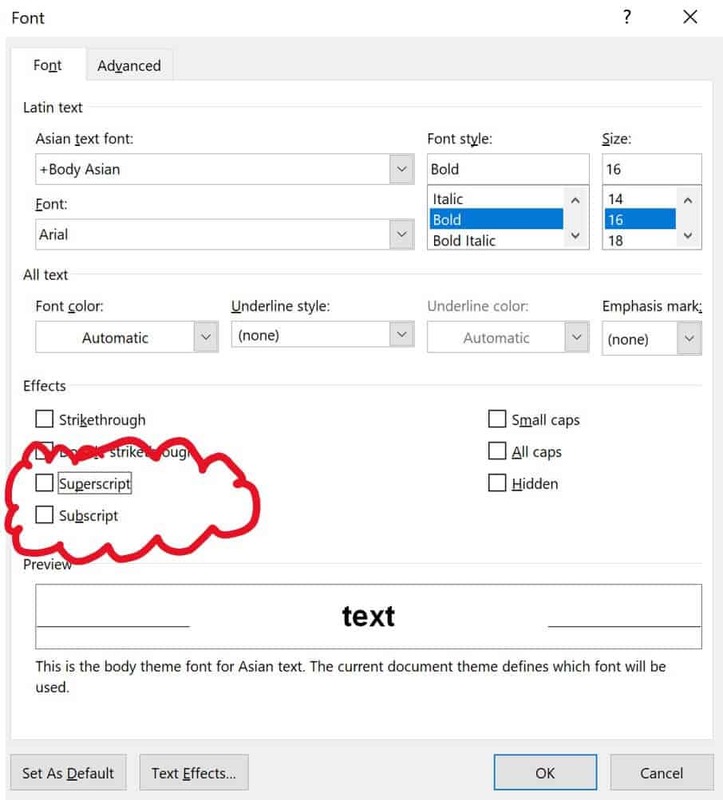 One other thing you can do with superscripts and subscripts in PowerPoint is to adjust the offset in the Font dialog box as pictured below. The only way to create a superscript and subscript in Excel outside of the mathematical equations tools, is through the Format Cells dialog box pictured below. Special Note: In Excel your superscript and subscript formatting will not show in the formula bar in your Ribbon (as pictured below). It will will only show up in the cell where the formatting has been applied. 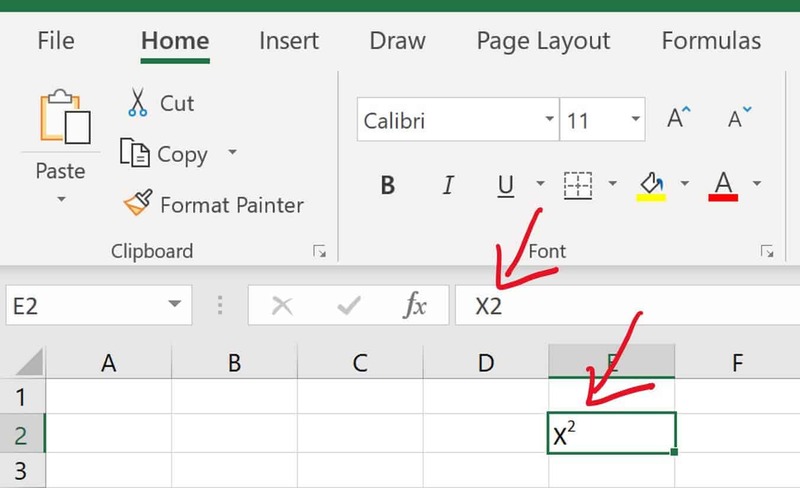 If you don’t want to memorize the format cells shortcut, you can always open the Font Dialog box by clicking the downward facing arrow in font group in your Excel Ribbon (pictured below). Also note, inside the Font Dialog box you can use your keyboard shortcuts to select or unselect the Superscript and Subscript commands (which you can see by the underlined letter in each).